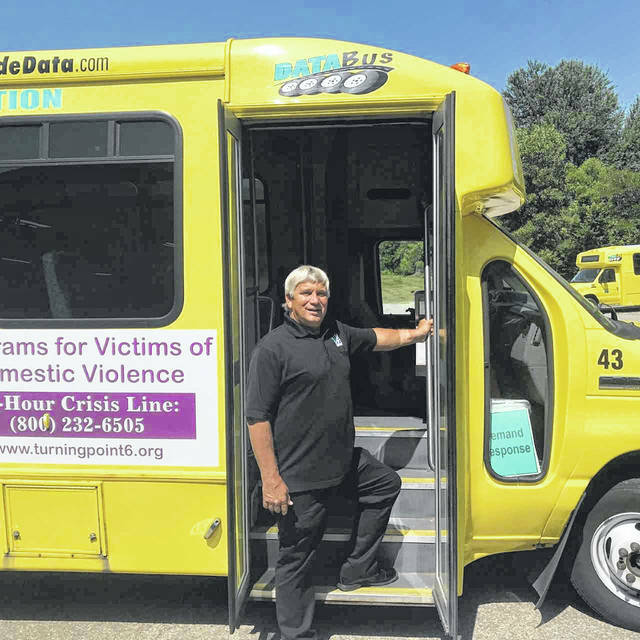 Delaware Area Transit Agency Executive Director Denny Schooley poses for a photo on the steps of a DATA bus. For 20 years, DATA (Delaware Area Transit Agency) buses have served the transportation needs of residents all over Delaware County. As DATA Bus celebrates its 20th anniversary, the leadership of the Delaware Area Transit Agency is hardly resting on their laurels. Despite the success and growth of the agency throughout the past two decades, its focus is fixated on what’s to come. That current mission and vision, Schooley said, is “a ride for everyone.” That hinges on affordable and accessible transportation to the residents of Delaware County. Some of the aspects Schooley said are being analyzed are traffic congestion, getting people around better, and focus on economic development. He added the residents who have taken advantage of the service provided the most have been senior citizens, those with disabilities, and residents with low income. In looking to the future and the best way to serve the community’s needs, Schooley talked about the possibility of moving away from traditional public transit models and shifting towards on-demand services, such as Uber and Lyft. If DATA were to begin offering those services, Schooley said they would start in the Delaware city core and then possibly expand out to the rest of the county. Schooley also said they have had several people recommend programmatic-type transportation, for specific events happening in adjacent communities or within Delaware. Popular suggestions included Ohio State football games. Another service being considered is a fixed route outside of Delaware that may only run twice a week, but would allow people outside of the city to get into Delaware and use the city routes to do things such as run their errands and make their doctor appointments. Routes he mentioned as possibilities include Ashley, Ostrander and Powell. While those ideas are certainly being considered, Schooley was quick to add that everything that is on the table is still being researched and analyzed for a variety of factors. Research and feedback from the community, he said, has mostly been done through community surveys. Part of the mission and vision project the company is undergoing, he said, is figuring out how they will move forward into the future with funding that is not stable. “We need to figure that piece out in order to figure out services people can count on and guarantee they’re going to be there,” he said. The funding DATA receives is primarily from the federal government. While the agency receives some state funds, Schooley said the state budget for public transit has been significantly cut since 2000. He added there are local sources of funding, such as SourcePoint, who provides DATA with a grant that goes toward the fixed routes around the city of Delaware. The trade-off for DATA is providing service that is more accommodating for senior citizens. Last month, DATA showed off a newly remodeled facility, which cost about $1 million dollars. The investment into its own future should signal a commitment to the future of the county. As Schooley sees it, that future should include an emphasis on jobs moving into the area. He expects more and more people who live in other counties to begin working in Delaware County, and said the public transit system needs to be there to support those jobs and employers.